This is Permanent Walkabout. Travel is a state of mind. One year and twenty pounds later, my food writing hobby is on pause for now. Save me from myself. I've written so many Yelp reviews I've been bestowed the dubious honor of Elite Status Queens Expert. So of course I'll try this plate piled high with Brazilian grilled meats and plantains...to write a crucial review of course. Or a late night bowl of pho filled with mysterious cow parts...for "research." And of course, the countless trips to the all-you-can-eat Chinese BBQ and hotpot joint—the ultimate place for gastronomic overindulgence with groups of friends. As of late, there have been way too many soju fueled nights of dunking pig's blood tofu and pickled beef into sesame chili oil sauces. It was fun while it lasted but now my pants don't fit! So yeah...back to the pescetarian diet that sustained me and kept me in good health for many years before all this madness began. The hedonistic meat frenzy was a true joy but like all good things, it had to come to an end. I've always preferred discipline to moderation. How anyone does this kind of work full time without suffering the consequences is beyond me. More power to the lithe, booze and pork guzzling, indestructible Anthony Bourdain's of the world and the army of aspirational social media clones. May their skinny jeans forever stay skinny. On neighborhood geography and naming conventions, please refer to my previous post. The food selections in this post are the last crop of neighborhood establishments I deem worthy of sharing. I'm sure there are more. Many more. It's just that finding them is such an expensive and caloric prospect. I have my go-to spots, 20 at least. That's more than enough I'd say. The good news is there's always somewhere to eat close to home! Like I mentioned in my last blog on this—one could spend a lifetime eating their way through this part of New York City. I've spent about five years doing it and have barely scraped the surface. So here we go in no particular order. 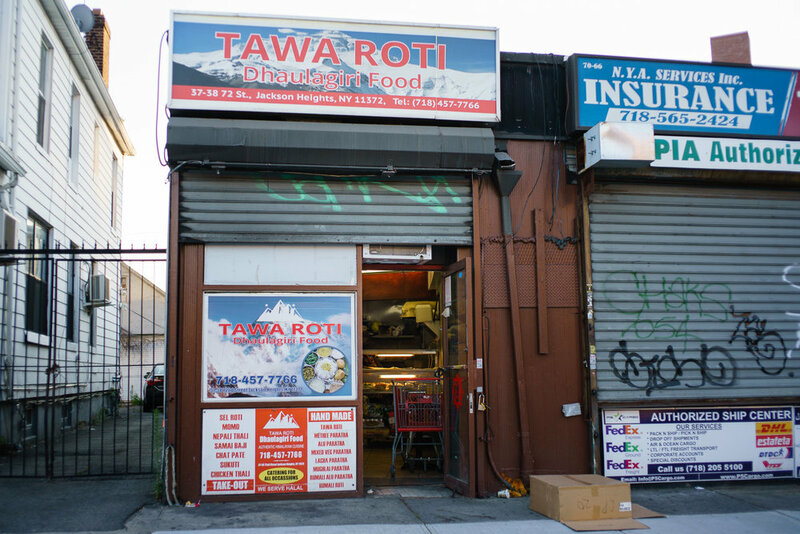 Tawa Roti Dhaulagiri Food, 37-38 72nd St. I've walked past this tiny door so many times but always avoided it because I thought is was a catering place. Upon entry I found that it can actually seat 9 people semi-comfortably. One dines in an open kitchen along with bubbling pots of curry and beef strips hanging to dry under the air exhaust. The place is a real trip. I didn't really know what to expect other than that the food is loosely "Himalayan," i.e., Tibetan, Nepali, with some western Chinese and northern Indian dishes thrown in for good measure. These days there are so many places in J Heights serving this kind of food. Most are mediocre at best. With no expectations, I gave the cook little more instruction than to make me a vegetarian thali. It was delicious. Yep. Sketchy AF. Like all the best eateries in Jackson Heights. Vegetable and spice perfection for $8! Tawa Roti's kitchen and dining room is one long corridor-like space. I love the Himalayan mural. Tawa Roti's veg thali was one of the tastiest things I've eaten in ages. The dal might be the best I've ever had. Half the things on this plate, I don't even know what they are. I love mystery curries and pickles! Though I will not personally be trying, I saw the cook making some tasty looking meat dishes as well. Probably goat. This place rules. No fresher goat anywhere in the city than Jackson Heights! I warned you this blog isn't like the others. No holds barred here. 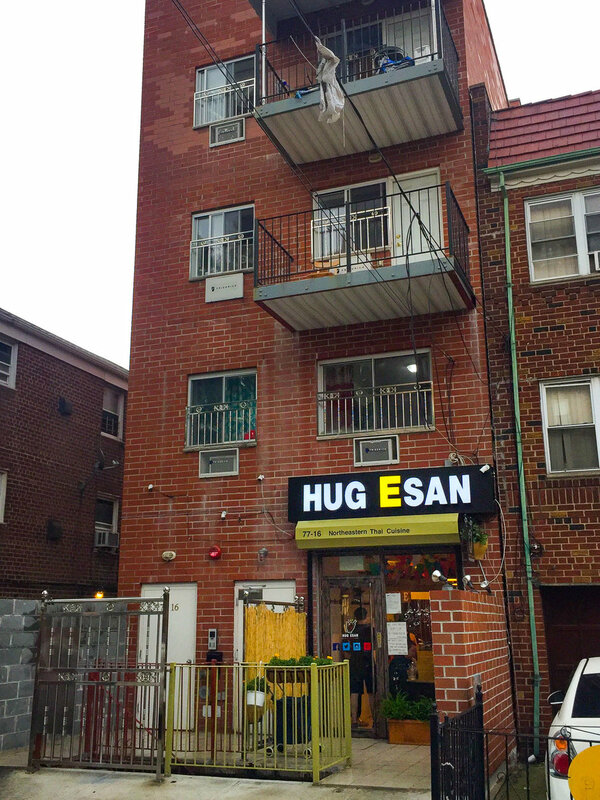 Hug Esan, 77-16 Woodside Ave. Thai Town's newest edition is the ridiculously cute, Hug Esan, seriously no wider than a one car garage. Looking at the building, I think it might actually be a one car garage. Well, I love what they've done with the place. Not sure the zoning on this one but it seems legit. Somehow this place can seat 20. Esan aka Isarn aka Isan aka E-san (you can see the problem of the lack of an official way to romanize Thai language) is Thailand's northeastern region. Being geographically and culturally close to neighboring Laos, it has a cuisine that's a little different than the "standard" Thai we're used to eating here. It's very pork heavy with oinker parts finding their way into virtually every dish. You'll not find any ocean life in this food as the region is hundreds of miles from the coast. Instead you'll find dishes like Larb—a salad of roasted rice, fresh herbs, and of course ground pork or perhaps river catfish. It usually has a heavy mint and shallot flavor and is utterly delicious. True to form, there aren't too many veggie items on Hug's menu but I had Tom Zabb soup with mushrooms that was so spicy it made my head explode. The heat was well tempered with some grilled sticky rice cakes though, something I've never had before and were a tasty addition to the soup. My cursory assessment is this place is very authentic, a good value, and the service is excellent. I will be back for the papaya salad with pickled river fish and crab. $7 for soup, $3 for rice cakes! Lots of bargains on this menu. The Ready Penny Inn, 3707 73rd St. I've not covered any drinking establishments in my writing on J Heights probably because there isn't really one solid watering hole to be found. There are some Irish bars in nearby Woodside and a few places you can get a drink in Thai Town but there isn't a drinking scene per se in this part of Queens. Unless of course you're willing to risk getting knifed in one of the dancing girl bars on Roosevelt. There was one night early in my tenure; after stumbling off the 7 train in a drunken haze and deciding I needed another (I didn't), I found my way into the Scorpion Bar. After ordering a whiskey and soda in my broken Spanish, I looked around slowly, realizing I was most likely in a gang hangout. I don't know, the inked-up guys in black bandanas scowling at me sort of gave it away. I politely made my way to the exit but still in need of a night cap, I stumbled over to 73rd and that's when I discovered The Ready Penny Inn—the last Irish pub in Little India. And the only proper dive in the entire neighborhood. The Ready Penny Inn. Where the pros come to drink. Google Images. If you want to have a drink, go to Astoria, or to anywhere in Brooklyn or Manhattan for that matter. This is not the neighborhood for it. The Ready Penny is a horribly depressing place and I can't recommend spending time here in good conscious other than to appease morbid curiosity. If you want to see late stage alcoholics falling off bar stools, this is the place for it. It is cheap though and if you don't have a lot of $$$ and are looking to tie one on, it can easily be accomplished here. This is no doubt a storied neighborhood institution, but one best left avoided in my opinion. Raja Sweets and Fast Food, 7231 37th Ave.
On my current veggie kick, I've been looking all over for cheap, healthy options. Raja Sweets has got an unbelievable deal—pick 4 curries from a daily rotation, along with rice, chapatis, and lime pickle—for $8! Everything I've tried so far has been great and the family that runs the place is super nice. Chickpea heaven for $8. Not much to look at but gets the job done. 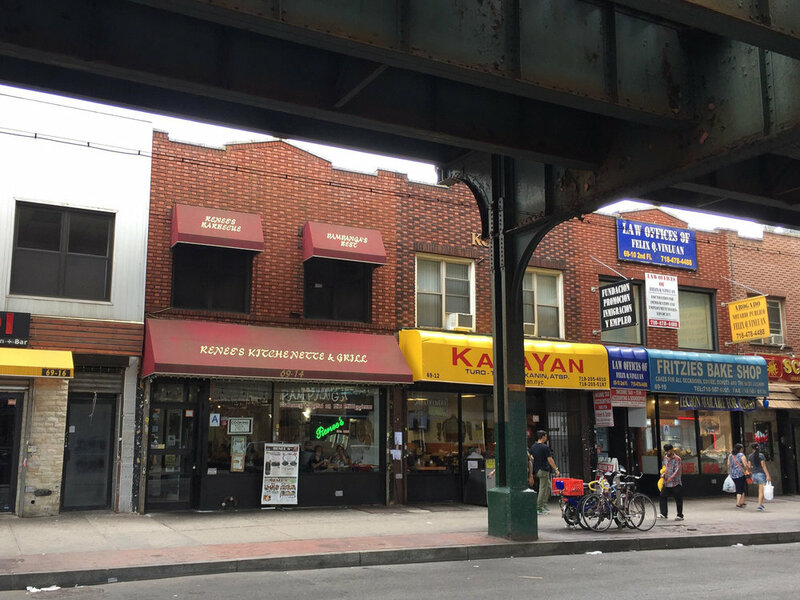 Renee's, 69-14 Roosevelt Ave. I've realized there are probably as many Filipino joints in the hood as there are Thai places. I'm not super into this cuisine but Renee's is delicious. The grilled milkfish and garlic fried rice are especially good. I'll try again soon and do a more thorough write-up but I wanted to put it on the radar. Plate of Filipino goodies. Google Images. Auttharos and Sake Bar by Zabb, 71-28 Roosevelt Ave. Late night, cash only joints that used to be Zabb Elee. I loved Zabb and as far as I can tell the menu is mostly the same. It's Isarn cuisine along with some standard Thai staples...your pad thai, pad khee mao, etc. Everything I've tried has ranged between pretty good and delicious. It is SPICY though. Not for the faint of heart. Down the stairs used to be Sushi Boy now it's Sake Bar by Zabb. This is a solid sushi joint. Probably the only one in the entire hood actually. They do all the standards plus some fun Thai twists on specialty rolls. Nice sakes on hand as well. What really sets Auttharos apart though is this mind bending papaya salad. I've had it. It was $50 and I ate it with a friend and we could barely walk out afterwards. It was as awesome as it looks. I've never seen anything like it and if this was their idea, it's a great one. Auttharos does a lot of these delicious Thai soups in the stainless steel sterno pot. Here is a savory Tom Yum Goong (shrimp). Google Images. Playground, 71-30 Roosevelt Ave. Conveniently located next door is another late night, cash only Thai joint. This one is much more a fun hangout spot for young Thai expats. Standard fare with some interesting additions like ant egg salad—very good, very spicy, lots of fried rice and fried noodles—if you go with a Thai speaker you can order crazy stuff not on the menu. Thai soaps and music videos are always on TV. A little slice of Bangkok in New York City. A perfect pile of insanely spicy Crab Fried Rice, the mark of a decent Thai restaurant. iCook, 81-17 Broadway. Ah, how I love this place. All the hotpot you can eat for $21, all the BBQ you can eat for $25, or all you can eat of both for $32. And it's a proper, cook it yourself joint which makes it way more fun. The menu is extensive—every kind of meat and seafood, every kind of vegetable and noodle, tons of sauces, rice and banchan. Not too mention cheap pitchers and soju. You can hang out in here, indulging and getting blasted for hours, and without spending a fortune. I actually suspect much of the weight I've put on in the past year is because of this damn place. It is delicious and overdoing it is the name of the game. Be forewarned. Say goodbye to your summer clothes. "Healthy pot" is however, totally do-able. Above is an order of spicy flounder filet, fried tofu skin, soft tofu, lotus root, tomato, fake crab, straw mushroom, wood ear mushroom, watercress, fermented soy based sauce and sesame based sauce. It's definitely not taking full advantage of the menu but is equally satisfying. Such an order lacking in meat though will most likely be judged highly questionable by your waiter who may feel compelled to point out the available meat options multiple times. Ah fake crab. One of my favorite fake foods! Hot out of the pot, dipped in sesame chili oil...few things are better. I've been in here so many times, I guess I got so excited about the spread that I forgot to take tons of photos. I'll get some next time I go with a group. In the meantime, here are some shots of what obscene, all-you-can-eat hotpot and BBQ looks like. Double Pot - Spicy and Traditional broth. Google Images. BBQ and banchan. Google Images. As you might expect with such a bargain, it does get a little crazy in here on weekends so if you have a big group and it's not happening, there's another place nearby that's pretty good. Shell Cove, 83-02 Broadway. Not as extravagant as all-you-can-eat iCook but if you have your heart set on hotpot, it gets the job done. FYI $10 lunch special. There's a sister restaurant next door called, Chinger (Chinese Burger) that serves western Chinese style lamb burgers. Cheap and tasty. That's all I've got on this one. Now, I could really use a salad. When is Chopt opening up out here? Kidding. No trendy salad or juice places in Jackson Heights please. This is one of the most unique parts of New York and though the gentrification currently ravaging and homogenizing many parts of the city will no doubt eventually arrive in full force, I'm optimistic that the neighborhood will retain its character for some time to come.